You're looking at what possibly is the first ever, tue aluminum bumper case made for the iPad 2. Is it just me or does this look simply stunning? 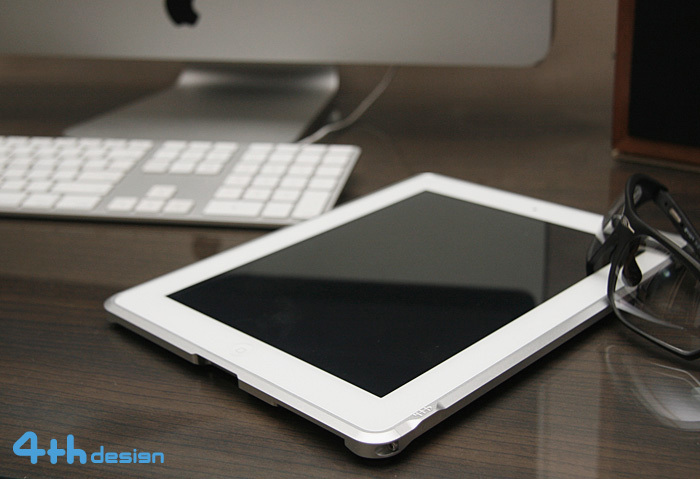 The 4th aluminum bumper for the iPad 2 is made by the same designers who created the favorable Blade aluminum bumper for the iPhone 4 called 4th Design, which are known for their precision and close attention to detail. The 4th aluminum bumper for the iPad 2 is sand blasted for that matte finished look. Creating such a massive aluminum bumper for the iPad 2 is no easy task, but it looks like 4th Design has thought about just everything. The back is fitted with rubber, anti-slip corners so that the back of your iPad 2 won't get scratched up when you set it on a table. Large cutouts were made to insure easy access to buttons and ports alike. And there are even silicone inner lining that were applied on the inside of the 4th bumper to prevent any potential damage and scratching from being made to the iPad 2's aluminum. This reminds me of ColorWare's Grip, a poor attempt at an aluminum bumper handle for the iPad. If you like the 4th aluminum bumper as much as I do, you can pick one up for $119. Plastic just doesn't cut it anymore.